Breast cancer is one of the most frequently diagnosed cancers and is the second leading cause of cancer death in American women. By changing your diet, you can do a lot to reduce your risk of getting it. Scientific studies have also revealed that 90–95% of cancer cases have their roots in the environment and lifestyle factors. Healthy body weight, which goes hand in hand with healthy eating, is another factor that can reduce the risk of many cancers and also needs to be considered. By changing your diet for the better, you will likely influence your body weight as well and bring your BMI into the healthy range. The evidence base behind certain foods’ anticancer potential is rapidly growing, but more evidence is needed and the research in this field is ongoing. A study published in Pharmaceutical Research on 2008 concluded that only 5–10% of all cancer cases are attributed to genetic defects, whereas the remaining 90–95% have their roots in the environment and lifestyle factors. These include smoking, diet that includes fried foods and red meat, alcohol, sun exposure, environmental pollutants, infections, stress, obesity, and physical inactivity. The study claims that there is evidence indicating that of all cancer-related deaths, as many as 30–35% are linked to diet, almost 25–30% are due to tobacco, about 15–20% are due to infections, and the remaining are due to other factors like radiation, stress, physical inactivity, environmental pollutants etc. That means that we can do a lot from our side to reduce the risk of cancer developing in the body. Environmental pollutants are a major factor that should be mentioned in the context of breast cancer. A scientific report published in the Journal of National Institutes of Health on 2014 mentioned that certain chemicals used on a daily basis could increase the risk of breast cancer. One of the top offenders was the category of flame retardants. This category refers a group of substances that are added to flammable materials to prevent the onset of fire or to provide extra fire protection to the material and provide more critical time to escape if there is a fire. For example, flame retardants are used in furnishings, such as foam, upholstery, mattresses, carpets, curtains, and blinds. The study mentioned another 17 higher-priority chemicals or chemical groups based on exposure and carcinogenicity. Another major category is parabens found in cosmetics and antiperspirant. A study published in the Journal of Applied Toxicology on 2012 said that paraben esters were found in 99% of the 160 tissue samples collected from 40 women who had mastectomies. This result suggests that the use cosmetics containing parabens could increase the risk of breast cancer but more studies are required. Scientists have difficulty studying the role of diet in cancer development. It is not easy to single out one factor and make direct links to cancer. Different studies don’t always reach the same conclusion and there is inconsistency in this area of research. There are some clues, however, that show there is a connection between diet and breast cancer development. For example, Japanese women have a lower risk of breast cancer compared to American women. But if they immigrate to the US, their risk becomes equal to that of their American counterparts. One of the most obvious changes in America is the food; fish and vegetables are replaced by processed foods and sugars. It seems that diet alteration makes the Japanese newcomers more susceptible to this deadly disease. Researchers warn that there isn’t one single nutrient that will grant you breast cancer protection. It is usually the combination of different foods that are able to work together and optimize health and cancer protection. What follows is a description of foods that have been researched in relation to breast cancer prevention and have received some scientific backing. Fiber, the indigestible part of plant foods, is often associated with a healthy diet. Fiber is found in fruits, vegetables and whole meal cereals. Wheat bran is a particularly good source of dietary fiber when it comes to cancer prevention. A review of studies found a 12% decrease in breast cancer risk with dietary fiber intake. Amongst other things, fiber consumption lowers the levels of hormone estrogen in pre-menopausal women which reduces the risk of breast cancer. It has been suggested that 25 grams of fiber should be consumed per day to help with breast cancer prevention in women who had not yet had their menopause. Fiber is also a great natural remedy for constipation. Generally speaking, if you eat a plant-rich diet, you will most likely be consuming fiber galore. Some researchers believe that it might not be the fiber itself that lowers the risk of cancer. More likely, a fiber-rich diet automatically means you are ingesting less sugar and more antioxidants, which makes you less prone to cancer. Also read my article on how flaxseeds can prevent breast cancer – Flaxseeds contain fiber, omega 3 fatty acids, and a very special ingredient called lignan. Studies reveal that it is most likely the lignans that are responsible for the positive results obtained from studies on flaxseeds for breast cancer treatment and prevention. Fruits and veges are a good source of fiber and antioxidants. Fruits and vegetables that are rich in vitamins A, C, E and selenium have a particularly potent antioxidant effect. Antioxidants prevent chemical reactions that can lead to gene and cell changes. An abnormal change to the cell can mean the start of a cancer growth. The ominous changes can happen during the oxidation process when oxygen joins with another molecule, so antioxidants work by stopping this process. Carotenoids are natural pigments that give some plants their distinct color and are found in the chloroplasts and chromoplasts of plants. There are over 600 different types of this coloring. Flavonols and flavones, also known as flavonoids, are protective compounds found in plants. Women who consume them in greater amounts have been found to have a lower risk of breast cancer. Berries – You can find more information about the amazing healing properties of berries in my e-book The Healing Berry Guide which will teach you how to transform your health with berries, and is a must for berry lovers. Pomegranate has many medicinal uses and is rich in beneficial flavonoids and polyphenols. This exotic fruit is now being studied for its anticancer potential. 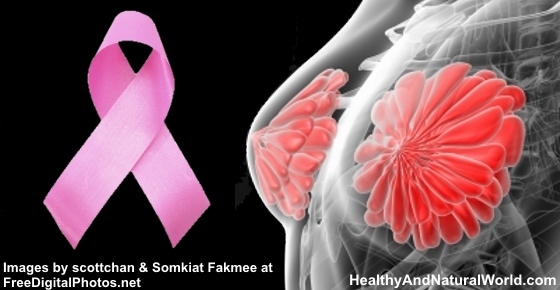 In mice, pomegranate extract and pomegranate seed oil reduced the occurrence of breast cancer by 87%. No matter the dose, the fruits have no side effects. For health effects and cancer prevention, consider eating one medium size fruit daily. Pure juices can be a good alternative as well. Pomegranate can also unblock your arteries and can prevent Alzheimer’s, Parkinson’s and Rheumatoid Arthritis. All in all, a plant-based diet is definitely a step in the right direction and is a good choice if you are serious about cancer prevention. Many studies have shown that vitamin D has anticancer potential and I’ve already written about 12 common diseases caused by vitamin D deficiency. It blocks cancer cell growth and regulates cell cycle. Women with higher vitamin D intake have been observed to have lower breast density on mammograms. Lower breast density is associated with lower risk for cancer. One study showed that post-menopausal women with the highest levels of vitamin D had up to 70% reduction in their breast cancer risk. Exposure to sun is very important for vitamin D production. Surprisingly, dark skinned people need to spend more time in the sun than people with fairer skin to produce the same amount of vitamin D. The vitamin is also present in fatty fish, fish liver oils and fortified milk. The amount of vitamin D you might need to supplement varies on your individual needs and sun exposure. Older women are usually recommended to take 800 to 1,000 IU of vitamin D daily, which also provides protection for their bones. Vitamin D deficiency may also lead to dementia. Maintaining proper vitamin D levels is one of the 70 habits featured in my e-book 70 Powerful Habits For A Great Health. Curcumin is the active ingredient in turmeric spice and is used to prepare many delicious curry dishes. Curcumin may cause the death of cancer cells and it appears to be effective even in cases of breast cancer resistant to traditional chemotherapy. Turmeric is also one of the top 14 foods that protect against cancer development. You do need to be aware that turmeric has low absorption and rapid metabolism that lead to relatively low bioavailability in the body. But you can greatly enhance turmeric’s bioavailability by consuming certain foods and you can learn about them in my post on how to optimize turmeric’s absorption. Curcumin has other amazing health benefits: it is anti-inflammatory, can be used for treating knee osteoarthritis and can also rejuvenate your skin. Omega-3 fatty acids – found in some freshwater fish and marine life – can play an important role. Scientific studies indicate that their regular intake can lower your risk of breast cancer by up to 14% by consuming two portions of oily fish every week. You can read more about the research that was published in 2013 in The British Medical Journal (BMJ) in my article about the scientifically proven benefits of consuming omega 3 fatty acids. There are a number of scientific reports and studies that explain how olive oil can help you to reduce the risks associated with breast cancer, and I’ve mentioned them in my article about how to use extra virgin olive oil to prevent breast cancer. Add two tablespoons of extra virgin olive oil a day to your diet. Add it to your salad dressing or coat the olive oil on fish, meat or veggies before baking or roasting them or use olive oil on your morning toast.